When I first played Goat Simulator I figured it would be as ridiculous as it sounds. And of course, it most definitely was, there was certainly no disappointment in that fact. But it also had something else, an odd bit of fun. A moronic charm that kept me wanting just a little more. My angel, muscle, skull-masked, jet-pack goat. The whole game is predicated on the fact that it was made to be absurd. Out of all the strange things to play, this is one I come back to purely for comedic relief in a time when #GamerGate is flooding all my game related feeds and the video gamer climate is as volatile as I've ever seen it. There is something very relieving in being able to pick this game back up and not have any worries at all. Mindless fun can be of great value in some cases, and we could use it right about now. That being said, Goat Simulator isn't something that takes anything seriously, and to its credit, that is a wonderful accomplishment. It'll never win awards for its technical merits, or its depth of storytelling achievement. The game was made to be enjoyed for its stupidity. Plain and simple entertainment. It has a lot of small bugs, but none of them are so terrible I stopped playing. Wonky physics be damned, I'll continue to run amok as a steroidal devil goat wreaking havoc among the seemingly idyllic town I inhabit as a nice getaway. There are a ton of small homages and secrets to be found, such as the Teenage Mutant Ninja Turtles I came across in the sewers beneath the city. A couple mini-games like Flappy Goat are in there as well. With your goat-born powers of bleating, ramming, and licking you are dropped into a sandbox world with no real goals. Sure, there are points and points multipliers, but does anyone really care about that at all? I found all the fun I could want simply sitting back and enjoying the physics-based hilarity from going all out and trying new and ever-more-idiotic-than-the-last-time shenanigans over and over. But really, that's all it needs to have. A couple hours of laughs every so often. Being abducted by aliens, sent flying through the air from an exploding gas station, and finding the Dark Goat Lord's altar were enough for me. There won't be any lasting impact, but the brevity is appreciated. I never expected this to have weeks of replay time- this is the video game equivalent of a candy bar. Short and tasty. 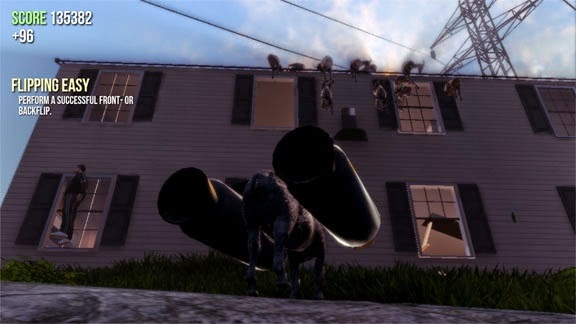 Goat Simulator is a game comprised of solely nonsensical silliness and it's all the better for it. Now that it's also out on Android devices, I am actually considering carrying around this huge amount of novel stupidity in my pocket. TMNT: Danger of the Ooze: Launch Trailer!